This species is accepted, and its native range is Mexico to Colombia, Bahamas to Hispaniola. Nativa en Colombia; Alt. 300 - 500 m.; Andes. Shrubby herb to 1 m; cystoliths present. Leaves ovate to elliptic, apex acute, base attenuate. Flowers in open axillary cymes from upper axils; bracts and bracteoles minute. Calyx deeply divided into 5 linear glabrous lobes to 2 mm long. Corolla orange to orange-red or mauve to pink, to 5 cm long (along upper lip), with slightly hooded 2-lobed upper lip and recoiled 3-lobed lower lip. Stamens 2, held under upper lip; anthers bithecous with thecae almost at same height, lower theca apiculate. Native of Central and South America. Widely cultivated in the Old World tropics. Jacobinia macrophylla (Oerst.) Benth. & Hook.f. ex Hemsl. Balick, M. J., M. H. Nee & D.E. Atha (2000). Checklist of the vascular plants of Belize Memoirs of the New York Botanical Garden 85: 1-246. —Darbyshire et al. 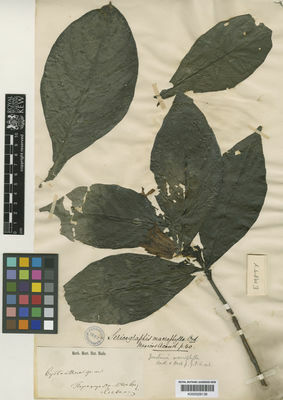 in F.T.E.A., Acanthaceae 2: 731 (2010). —Maroyi in Kirkia 18: 194 (2006).